The website and the blog had been down for a while, as has my email (sorta). So I wasn’t posting at all. But that is all sorted out now and I would like to kind of write a bit about my March and April, although just hitting the big points. March 26th I took Zen to the science centre. There’s a funny picture from that day down below. It was a lot of fun. 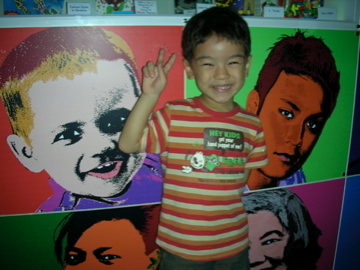 The following weekend we went to Kuala Lumpur, again by train. This time we didn’t make any of the mistakes we made last time (like missing the train in Johor Bahru!! ), although because we didn’t book early enough, the Saturday-up-Sunday-down tickets were sold out, so we took a day off work Monday and just went up on Sunday, came back on Monday. Sunday morning we took a taxi to the main train station in Singapore, which is not far from where I work, and hopped on a train. Had a funny incident where we dumped the yummy lunch that Naoko had prepared on the floor, and there was less to munch on. Oh well. When we got to KL, we checked into the Mandarin Oriental, which is right next to the Petronas Towers (until recently the highest buildings in Asia, also the setting of that Sean Connery, Catherine Zeta-Jones flick “Entrapment”). Went for a nice rooftop swim, then down to the San Francisco Wharf (or something like that) restaurant for a lovely outdoor dinner, then up to the room to hang out, take a bubble bath, and be chilled. Sunday, April 3rd we woke up, went for breakfast (not so great), then when we were going back I found the right moment in the lounge to give Naoko her anniversary present (actually, I slipped it to Zen and asked him to give it to her). She opened it, it was a simple silver Tiffany ring. She was so happy to wear it. She had wanted to have a Tiffany engagement ring, but when we went to the shop in Kobe to check it out in 1996, she was disappointed by the poor selection and the outrageous prices. Now, nine years after the wedding itself, I got her one. She was so happy. After that, we went for another swim, checked out, went for some shopping, then to the train station for the long long long ride back to Singapore. Nice. Fun! 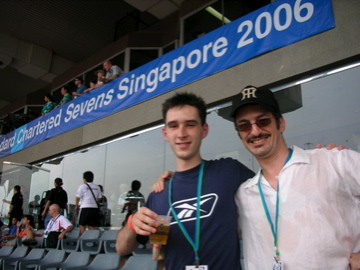 April 9th I went to a rughby sevens event. Rughby sevens is a quick, slick, down and dirty form of rughby where matches are only 14 minutes long, great fun. We had been invited to sit in the corporate section, so we had an air-conditioned room to grab food from, plenty of elbow room in the seats, and people coming by to ask us if we wanted another (complimentary) beer. I went with my friend Sean, and I met my colleague Chris and his dad there, both of whom are big rughby fans. I didn’t understand what I was watching, but the atmosphere was great fun. Left before the semi-finals so that we wouldn’t have to endure drunken madness getting home. Left the stadium and saw a great sunset over the harbour. 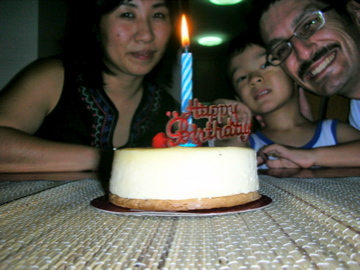 April 20th I had a great birthday. That whole week happened to be parent visit days at Zen’s new school, so I took the opportunity to request that day and I took half a day off work (I would have taken the full day – a day off work is the ultimate birthday present of them all – but there was too much stuff piling up at work so I only made it a half day) and went in to Zen’s school. 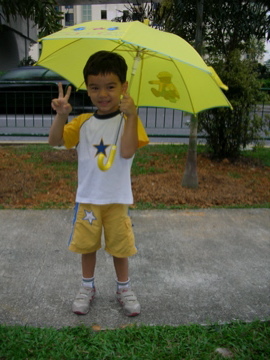 Zen was very happy to see me there, and tried very hard to excel in his class exercises. It was during the week of Chinese lessons (he has a full week of English emersion, rotated with a full week of Chinese emersion). So the teacher drilled drilled drilled Chinese words and the sentence permutations. She also asked me to read a book to the kids, so I chose a book that tells a tale about a bird looking for his mother, kind of like “Are You My Mother”, but with a twist. The kids went out to the playground for stretches and play. The teacher asked for a volunteer to lead the exercise, and Zen jumped up. He didn’t do so well, but I was happy to see that he was so keen to do well when I was there. I ate lunch with Zen and the kids, then they all sang “happy birthday to you.” It was sweet. 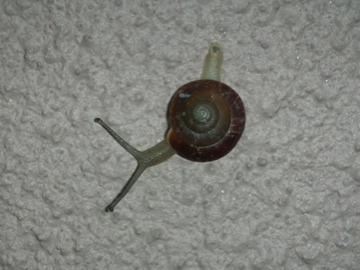 a close-up of Zen’s snail. Zen loves doing his Chinese homework, even while naked! This is from the Zippy comic strip. This “elf” looks a bit like Zen? I read a book to Zen on parents day in his school. I turned 37 and this was the cake I ate. 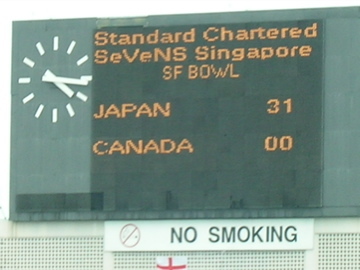 Canada didn’t do so well in the Standard Chartered Bank rughby 7s tournament against Japan. I was supporting both teams, so I’m glad that Japan won and I’m sad that Canada lost. This is Chris, a really cool guy! We took another bubble bath in KL. 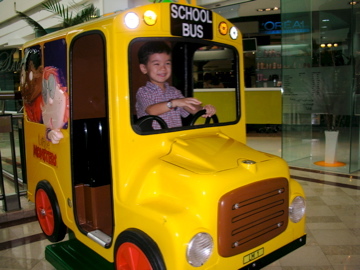 Zen was a bus driver in Kuala Lumpur. 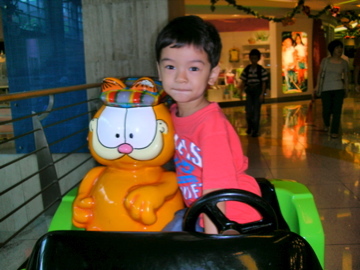 Zen rode next to Garfield in Kuala Lumpur. 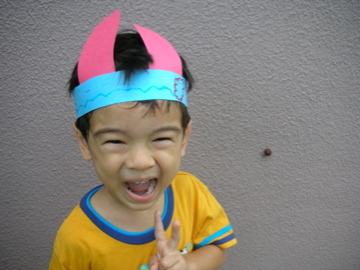 This entry was posted on Saturday, June 3rd, 2006 at 5:03 pm	and is filed under Uncategorized. You can follow any responses to this entry through the RSS 2.0 feed. Both comments and pings are currently closed.